Manda Hararo (Ethiopia). During 28-30 June several thermal anomalies and a large sulphur dioxide plume were detected, indicating a surface lava flow NW of the centre of the Manda Hararo volcanic complex. A scientist who visited the area on 8 July reported a 5 km eruptive fissure, fresh lava flows and multiple cones producing gas emissions. Mayon (Philippines). A rise in seismicity, crater incandescence and a slight increase in sulphur dioxide output have led to increased monitoring of the volcano by Phivolcs. San Miguel (El Salvador). An increase in seismicity was reported on 6 July, and seismicity remained elevated above background on 7 July. Sarychev Peak (Russia). An intense thermal anomaly was detected 1-6 July. Almost daily gas-and-steam plumes were observed, drifting 20-75 km NW, NE and SE, and reaching altitudes of 1.5-3 km a.s.l. during 4-5 July. There have been no large ash explosions since 16 June. Batu Tara (Indonesia). 1-7 July, ash plumes to 1.5-2.4 km a.s.l., drifted 35-110 km W, NW and N, and a thermal anomaly was detected on 3 July. Chaitén (Chile). 24 June-2 July, occasional activity was observed at the growing lava dome complex and seismicity decreased. An ash plume rose to 2.1 km a.s.l. and drifted E on 4 July. Dukono (Indonesia). On 5 and 7 July ash plumes rose to 2.4 km a.s.l. and drifted 65 km E (5 July) and 85 km NE (7 July). Kilauea (Hawaii, USA). During 1-6 July lava flowed SE through the lava tube system to the Waikupanaha and Kupapa’u ocean entries, and surface flows were detected through thermal anomalies and visual observations. In the Halema’uma’u crater a series of rockfalls took place beginning 1338 on 30 June. The first rockfall was associated with an explosion and a M2.4 equivalent earthquake. By 1600 more than 30 rockfalls caused by parts of the vent rim collapsing into the cavity had been recorded, and a few more took place on 1 July. No incandescence was initially visible within the vent following the rockfalls, but a few areas of incandescence became visible via the webcam during 1-2 July, and during 2-4 July a small lava pond and weak spattering was observed. Krakatau (Indonesia). On 3 July an ash plume reportedly rose to below 3 km a.s.l. Rabaul (Papua New Guinea). On 3 July an ash plume from Tavurvur cone rose to 4.3 km a.s.l. and drifted 45 km N, and on 7 July an ash plume rose to 2.1 km a.s.l. and drifted under 30 km SE. Sakura-jima (Japan). During 2-4 and 6-7 July explosions produced plumes to 2.1-2.7 km a.s.l. which drifted N, NE, E and SE. Santa María (Guatemala). Lahars 15 and 20 m wide descended the S flank of the Santiaguito lava dome complex on 2 July, and on 6 July explosions produced ash plumes to 2.8-3.2 km a.s.l. which drifted W.
Shiveluch (Russia). 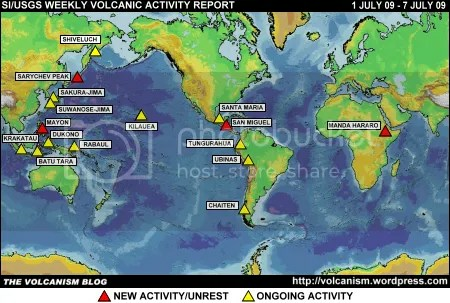 During 25 June-3 July seismic activity was above background and steam-and-gas plumes were emitted. Pyroclastic flows were observed on 25 and 26 June, ash plumes possibly rose to 8.1 km a.s.l. during 25-30 June, and ash plumes drifted 97 km NE on 26 June. A daily thermal anomaly over the lava dome was observed. On 3 and 5 July explosions produced plumes to 4.9-5.5 km a.s.l. Suwanose-jima (Japan). An explosion was reported on 6 July. Tungurahua (Ecuador). On 1 July steam-and-ash plumes rose 1 km above the summit and drifted WSW, ashfall was reported to the SW on 2 July, and on 2 and 5-7 July lahars descended SW and W drainages. Ubinas (Peru). On 4 July an ash plume rose to 6.7-9.1 km a.s.l. and drifted NE. The foregoing is a summary of the Smithsonian Institution/United States Geological Survey Weekly Volcanic Activity Report covering 1-7 July 2009. It is provided for information only, and is based on but not a substitute for the full report, which comes with its own criteria and disclaimers. The map base is derived from the Smithsonian Institution/USGS/US Naval Research Laboratory This Dynamic Planet website.